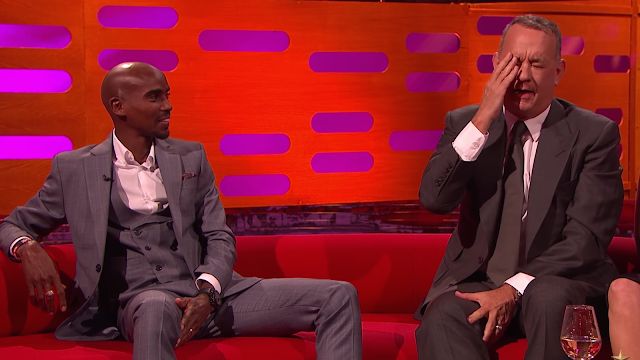 During his recent guest appearance on The Graham Norton Show, Tom Hanks was asked to re-enact one of his more well-remembered scenes from his Oscar Winning performance in Forrest Gump (Hanks also received another best actor Oscar in the film Philadelphia). From a body language perspective, it's profoundly illustrative to observe such skilled actors when they're "just being themselves" - and this example is no exception. 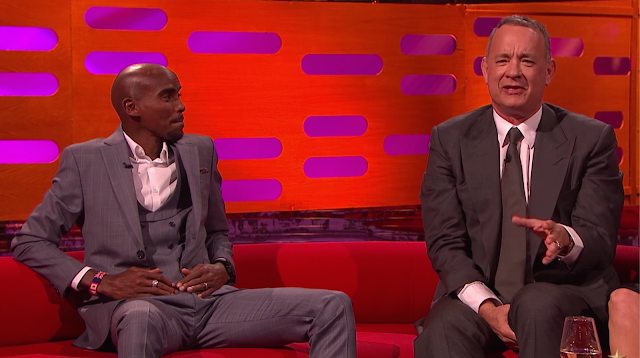 When Graham Norton asks him to re-enact the line from the film Forrest Gump - Tom Hanks (Sitting next to Mo Farah) immediately (and very briefly) touches his right eye with his right hand (2:21) as he squeezes his right thigh with his left hand (lasting about 2-3 seconds), an instant before he says "I would - be happy to do it, but you must show the lady with the cue card - because otherwise people will think I've actually memorized this so ...."
Hanks then proceeds to squeeze his left thigh for a longer duration. Real-life often has a mixing of several simultaneous emotions. When Mr. Hanks touched his right eye, this was (subconsciously) signaling his telling of a little lie ("I would - be happy to do it ...") - but also at the same time, he was feeling anxiety about the act of delivering the line - thus his thigh squeezing. Although professional actors "pretend for a living" (lying within the social contract of acting) - they're of course only human. Therefore their true selves (true emotions) are constantly "leaking" through - and are easily seen - if you know what to look for. The same is true in the every day world (for the other 99.99% who are not nearly as skilled as Hanks) - and their deception signals also leak through and are easily spotted - if you know what to look for.